Siesta Key has plenty of things to do from the land, but most would agree the water is where the real excitement is. Siesta Key locals know how to celebrate the wild and wonderful world of the gulf, with sunset excursions, yacht expeditions, and boat charters that soar atop the waters. Below are four of the best local Siesta Key charters. They all bring a little something else to the table, so call to price trips out and find that perfect vacation fit. Charters run from any time between 6 a.m. to 11 p.m. Captain Matt Fueyo, and his accomplished team, have decades of cumulative experience. With 15 years of Fueyo’s local and international fishing experience, you can have a rewarding family-friendly journey in Siesta Key’s waters. Bookings can be made online, in trip length sets of 2 hours (minimum 4). Reel Tight Fishing Charters provides unique services, including pick-up outside any of the local Siesta Key condo rentals, fishing license coverage, equipment, and more. Excursions range from 4-hour simple packages for near-coast fishing to 8-hour gulf excursions designed for catching incredible creatures, such as Goliath Grouper, tarpon, and even sharks. The crew also offers night snook fishing experiences. It is $500 for 4 hours of this riveting fishing experience. You can call the crew directly for more at (941) 444-9749. You can find the exemplary Siesta Key Fishing Charters hidden by the bridge on the north end of the island. The team is currently ranked as the largest fishing charter on the island, and it shows. Their offerings cover ambitious fishing adventures for prices starting at about $375 for a group. The crew has found some incredible success with yellowtail, porgy, and grouper on afternoon trips in season. The crew is also well-known for customizing the adventure. Tell the captain what you want: an excursion cruise to Lido Key or a run along the Siesta Key coast on the search for dolphin? All ages and experiences are welcome. Contact (941) 244-3474 to get set-up today. SiestaKation Charters is one of the all-around best places to chart the waters on Siesta Key. The crew has dipped into every area of water exploration, including snorkeling, sunset cruises, sandbar parties, fishing excursions, dolphin cruising, and more. Customers can help create their own charter experience. The team is proud to use their expertise of Siesta Key to delivering a singular and sought-after experience. The crew is led by U.S.C.G. Master Captain Josh Pritchett. He is a commercial diver and has a degree in Marine Technology, delivering a double-whammy of experience and knowledge. But it is his passion for bountiful water experiences for all ages that fuel the business. Prices are customized by the type of trip sought and how many people will be on the trip. Contact the crew of SiestaKation at (941) 993-7337. You can find charters available every single day of the week between 7 a.m. to 9 p.m.
You will need to head down to the southern side of the island for one of the island’s best offshore sport fishing charter options. There are three types of fishing types available. 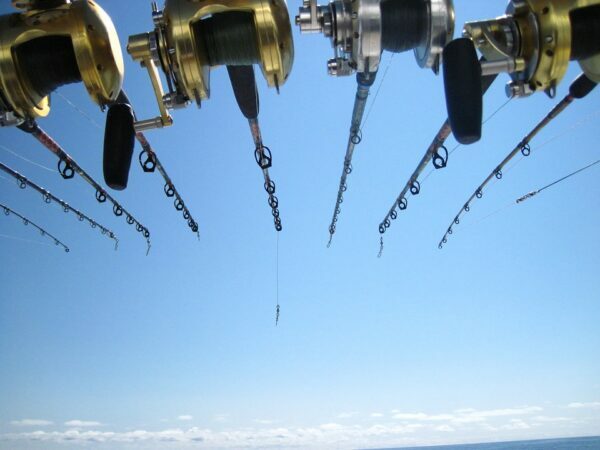 These include a bottom fishing trip, deep sea fishing, and trolling. You can seek out grouper, snapper, and amberjack on a bottom fishing adventure, while you will have more success with dolphin, blackfin, and yellowfin on a deep sea run. Trolling off Siesta Key often results in some impressive-sized sailfish and kingfish catches, among others. Captains Nicholas and William Froelich push to make sure every trip is wildly successful, unique, and educational. Contact Double Nickel Charters at (941) 504-2309. Stay at some of the most dazzling Siesta Key condo rentals for your fishing-focused vacation getaway. Contact us at 800-624-9276 to find out more.